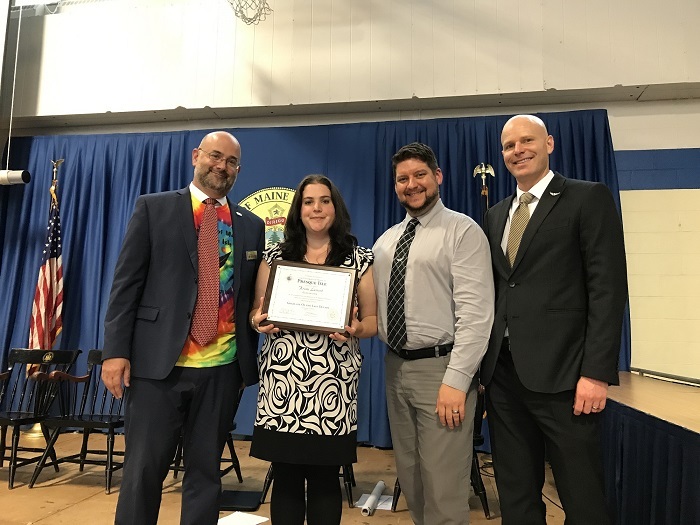 The University of Maine at Presque Isle and the Alumni Association recently honored an alumna with the GOLD (Graduate of the Last Decade) award during the University’s Convocation activities on Sept. 7. UMPI alumna Krista Lamont was named the recipient of the University’s second-ever GOLD award, which recognizes an alumnus/alumna who has made important contributions in his or her career field and community, and who graduated from the University 10 or fewer years ago. Lamont graduated from UMPI in 2009 with a Bachelor’s degree in Education. 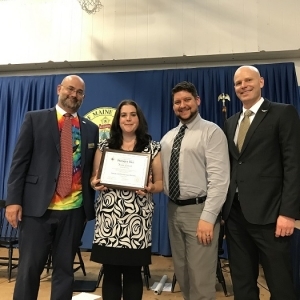 She had previously earned her Bachelor’s degree in Psychology from the University of New Brunswick and had gone on to UMPI to earn her teaching certification. She has taught around the world in Beijing, Tianjin, and her hometown of Saint John, New Brunswick, where she now resides. Lamont is currently a Site Director/Curriculum Developer for Bee Me Kidz. According to its website, Bee Me Kidz is a nonprofit, privately funded, free program for at-risk kids living in high poverty neighborhoods who are in need of a positive impact on their lives. The organization partners with parents, schools, and communities to empower and inspire disadvantaged children to develop the social and emotional skills that will enable them to succeed in school and life. With four locations in New Brunswick, the program ensures a child the equal opportunities every child should have in life. According to the nomination letter, written by her husband Matthew Creamer, Lamont dedicates her life not only to education but also to the children she serves at Bee Me Kidz. Lamont advocates for children, securing extra food and acting as a shoulder to cry on. She teaches them literacy and behavior skills through crafts, games, and social activities. Lamont teaches both children and their families that sexual and substance abuse are avoidable and not acceptable. Lamont said that the classes she took at UMPI were always her favorite and the behaviors and techniques she learned from her professors are methods she uses in her everyday work.